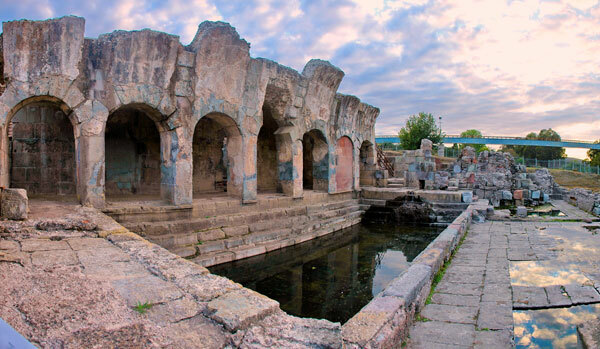 The Terme di Fordongianus, an important archaeological site of Sardinia, located on the left bank of the Tirso River, in the province of Oristano. It has springs from which flowing waters crossing the underlying volcanic bench reach the temperature of 54 °. The spa complex consists of two factories: a native plant based on natatio, which uses hot water sources, and another for artificial heating formed by different environments. Based on the architectural techniques adopted it is believed that they were built respectively in the 1st and 3rd century AD. The first building was built using the opus quadratum technique, which consists of overlapping blocks (trachits) squared in a parallelepiped shape and of uniform height. In the center there is the natatio, a large rectangular swimming pool with four steps to go down to the bottom of the tub; the hot water of the formerly drained source was injected by applying cold water from some upstream reservoirs. A bronze locking system made it possible to regulate the flows and to ensure an effective temperature regulation. The water was immersed in the pool through a panther-shaped decorative terminal still visible today.